Commutes from Nocatee and other northern St. Johns County locations are about to become less congested thanks to a new roadway opening this week. State Road 9B (SR9B), a four lane divided interstate highway connecting the eastern beltway of I-295 to I-95 in Duval County, opens to traffic today. The roadway, which connects southern Duval County with northern St. Johns County, has been in the plans since the mid 1970s. The new road provides a vital link in the overall transportation system by improving access to I-95 and relieving the heavily congested US1 and Old St. Augustine Road corridors. Prior to the American Recovery Reinvestment Act (ARRA) of 2009, the project was on hold due to lack of funding. By the end of 2009, the first phase of State Road 9B, from State Road 9A to U.S. 1, was finally funded. 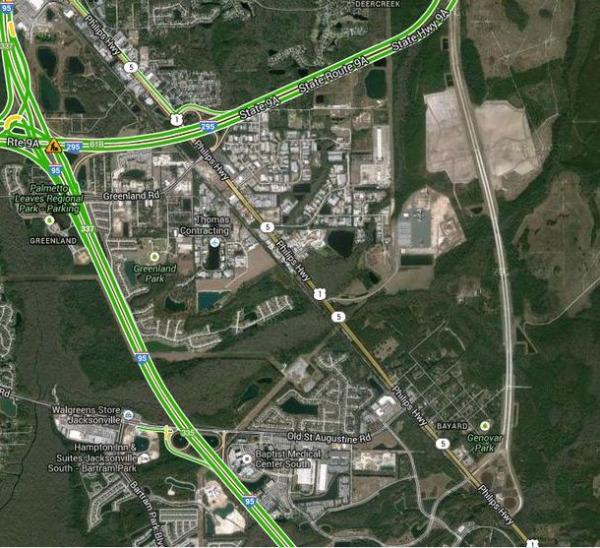 The construction of the second phase of State Road 9B between US 1 and Interstate 95 has been funded for a later date. However, the Florida Department of Transportation is working to form a partnership with the private sector to advance this project so construction can begin in early 2013. The road was constructed of concrete pavement and will initially have two travel lanes in each direction with 10-foot paved shoulders on the outside lanes, four-foot paved shoulders on the inside lanes and an 88-foot center median. The speed limit is 65 mph. The State Road 9B corridor is designed to ultimately accommodate eight lanes of traffic, four 12-foot lanes in each direction, with 12-foot shoulders on each side of the roadway. Read the full Ponte Vedra Recorder article here: http://buff.ly/16JdWCx. Read Jacksonville's WOKV news-article here: http://buff.ly/1gExwRO.